Around this time last year, every insider and their mother was reporting that the Eagles and Chip Kelly were going hard after the Titans’ No. 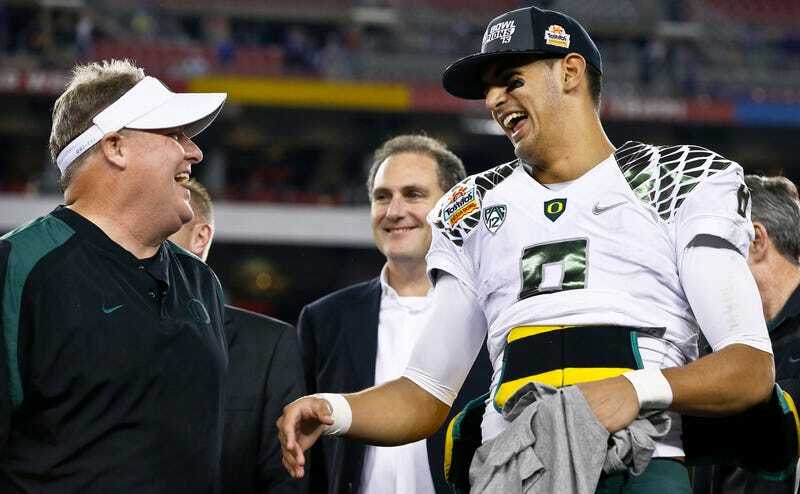 2 draft pick so Kelly could reunite with Marcus Mariota in Philadelphia. Kelly strenuously denied the rumored trade packages that included Sam Bradford and a raft of picks. No one believed him. And for good reason, it seems! Fox Sports’ Peter Schrager was on the radio with Colin Cowherd yesterday and stated as fact the package the Eagles offered the Titans for the Mariota pick. That’s a lot of pieces! Without knowing what Mariota will develop into (and how his development would have differed in Philadelphia), it’s impossible to say whether the Titans should have taken the trade or not. If this is indeed the package offered, I guess that Chip Kelly wasn’t technically lying. When he said “take any quarterback we have,” that’s not specifically offering Bradford. Who knows, the Titans are a mess and could have been really high on Mark Sanchez.